This discussion was created from comments split from: Obsidian v cpu hungry analogue modeling synths?. yeah... btw i was surprised by Jakob Haq's comparision of Model D app vs. real HW how close they was.. basically except of very high resonance (where app sounds really bad ) everywhere else it was 99.99% match. Their coders did excellent job. Yup the comparison is impressive. I’d be curious to see how close the two remain if the overdrive behavior is maxed out (slamming the mixer section with max level on osc 1 and on the ext instrument volume). Eg, around 8:15 in the video the overload light on the hardware seems to suggest there’s some non linear increase in gain on some resonance settings as the cutoff is lowered that the software might not reproduce. It’s also interesting to note that DRC’s 24db Lpf has more of these non linear quirks then model D when doing cutoff sweeps at max pre filter gain and high resonance. Yeah moog delivered on that one for sure. And for the patch scenarios where it isn’t so accurate, it kinda compensates by having the intentional innacuracies like polyphony etc. Bang for buck no question. Here is a good comparison and there you see where the iOS app "lacks". But i find the feedback emulation in the app wonderful. Together with the best filters in iOS land it is in my TOP5 for sure about analog synth (including all my desktop synth...and i have too many). I also think it is the best Minimoog emulation. Better than all VSTs i tested. However, software for me is as good as hardware (at least for 99% of sounds i make) and is more versatile and often comes with great FX on top. @Cinebient What's your take on the DRC 24db LPF vs Model D? Haven’t tried DRC, or even seen the gui or videos, is it pretty recent? Haven’t heard much talk of it, I’ll definitely check it out though, thanks for the heads up! Model D is the much better Minimoog for me since it actually emulates it. DRC has a different character. It might be the most dirty analog synth for iOS. It really can make brutal (in a good way) sounds but it´s sometimes a bit harsh and hard to tame. The filter in Model D is just better for me. Zeeon is the third i really love. These 3 are my goto on iOS for anlog power and they all have different character like a Pro One doesn´t sounds like a Minimoog or Octave Cat etc. DRC gets some extra point since i have it on iOS and on mac as well. From these 3 i also find the GUI and workflow the best. I love DRC for weird FX, strings and distorted bass. For juicy filter sweeps and punchy stuff and mellow brass i go for Model D. Zeeon is a monster with the mod-matrix. The most versatile of these and i love the zero delay feedback phaser and the BBD chorus (but the reverb is crap). There are just too many synth and my life is too short. Just bought (upraded) to Dune 3 and it´s beyond amazing. Oh and than there is my addiction to sample libraries and apps. The great things is most things you learn in synth translates good to others. Sometimes less is more to stay focuses but sometimes more is just more and i love to have choices and almost always i layer sounds to get what i want for a performance (plus extern FX mostly as well). And i must add that DRC must be the most CPU low usage virtual analog synth maybe as well. Not sure how the AUv3 runs on iOS since i use just single instances on my iPhone but i just tested to run 100! instances of it on my 5 years old notebook. It was a mono sound but with some modulations, FX and medium release time. Triggered all at the same time. DRC lacks the 3rd OSC but has a sub OSC and a ring modulator and some other nice stuff. And how good in this area (moog emulation) is Mood synth ? Just to make sure, this is the iOS App "Minimoog" vs the real Model D, and not the "Model D" iOS App! 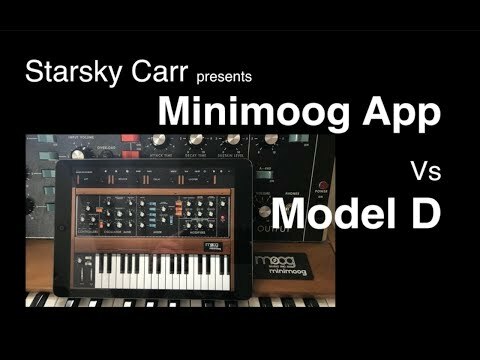 The Minimoog App looses against the "Model D" App. So, this comparison does not show the real thing. I saw a comparison where "mood" was very good, but the winner was "Model D" (the App). Mood is nice until you try to break out in the mentioned audio rate stuff and saturation with high resonance. Here Mood is miles behind (just my worthless 2 cents of course). This compares the real hardware (the Minimoog Model D which has the extra LFO like the app) against the app! YES! Uuuppss lol, yes...seems i posted the wrong one....i will replace it asap with the right one! MMhhh wait....it was already the right video. Now i´m confused. I thought i posted the iMini but it was the right thing. Model D Moog app vs. the actually hardware from Moog! @dendy This made me realize I actually don’t know where the distortion is situated in mood’s signal chain. The UI makes it seem like it might be post filter, but for moog flavor it would make more sense for it to be occuring (in part) before and during the filter stage. Playing around with it just now it doesn’t sound post filter at all but I might be wrong. I haven’t done any serious comparisons including Mood because I just got Model d this morning thanks to this thread 🤭. Hmm, apesoft replied to my question (email): “all the fx are post synth so after vco vca and vcf”. I’m very surprised that the distortion is post vcf, doesn’t sound like that at all to me. Interesting. I though it to be just "Moog Model D" as in "Moog Model 15" and confused "Minimoog" with another, older App.